Lil Dicky Makes ‘Most Epic’ Rap Video With Fetty Wap, T-Pain, Kevin Durant, Sarah Silverman, Dillon Francis, Hannibal Buress, Abbi Jacobson, Ilana Glazer, Mark Cuban, and Tom Petty. The video starts out with Lil Dicky dressed like he’s been wearing his home clothes for weeks knocking on big mansions in Beverly Hills asking for their permission if they can allow him to shoot a music video in their property for fifteen minutes. After many rejections, an old lady who supports plan parenthood group allows Dicky to film a cookie cutter hip hop video scene in her mansion. 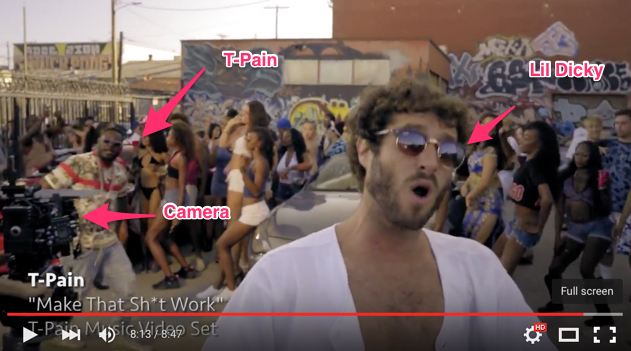 Lil Dicky crashes T-pain’s music video set so he can shoot a performance with the crowd. The result is pretty funny as you can clearly see T-Pain rapping in the background while Lil Dicky mind his own business rapping his verse.